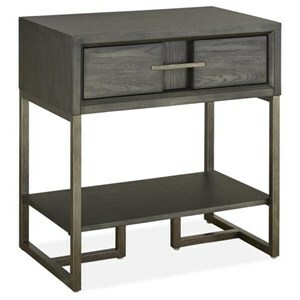 Benefit from some extra storage space while making a strong style statement with this contemporary nightstand. Its drawer fronts feature mirrored glass panels that stand out on top of polished stainless steel outlines. 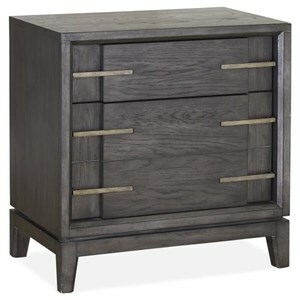 With a silhouette crafted from crisp, straight lines, this piece is sure to keep your bedside looking its best as well. The Interiors - Argenta Contemporary Nightstand with Mirrored Glass Case by Bernhardt at Reeds Furniture in the Los Angeles, Thousand Oaks, Simi Valley, Agoura Hills, Woodland Hills, California area. Product availability may vary. Contact us for the most current availability on this product. Case Construction Case is constructed of mirrored glass inset on top of glass end panels with non-beveled edges, mirrored glass drawer fronts with beveled edges, and a polished stainless steel frame. Embrace bold, modern style with this collection of storage pieces. The way this chest of drawers and nightstand mix mirrored glass and metal frames in sharp lines is sure to catch your eye. With functional features like metal drawer glides, fully stained drawer interiors, and anti-tip kits, these pieces are also built to last and to make your life easier. The Interiors - Argenta collection is a great option if you are looking for Contemporary furniture in the Los Angeles, Thousand Oaks, Simi Valley, Agoura Hills, Woodland Hills, California area. Browse other items in the Interiors - Argenta collection from Reeds Furniture in the Los Angeles, Thousand Oaks, Simi Valley, Agoura Hills, Woodland Hills, California area.